It’s a little bit silly at this point to whinge about the unfairness of Baauer’s career being defined solely by his gigantic smash hit “Harlem Shake", because Harry Rodrigues has continued to do quite well for himself even after fading from the mainstream. Importantly, his talent has been recognized by taste- and career-makers across the globe, most vitally by his own label (LuckyMe), but also through the continued support of countless critics both purportedly snooty and otherwise. And rightfully so: release after release, Baauer’s continued to kill it. “Clang” toggled the same hyper-colorful trap switches left cobwebbed after a disappointing Rustie LP the year before; the followup β EP saw him at the top of his game, his combination of booty-bouncin’ trap and a more muted take on bassy hip-hop masterful. Aa, Rodrigues’ newest offering, follows in the footsteps of his older work in a few major ways. Most frustratingly, it’s very brief, skipping from one idea to the next before the first is fully fleshed out. 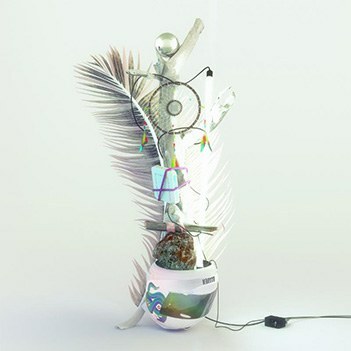 Given how good each single idea is, it’s a shame that Baauer hops from track to track so quickly. The glorious Rustie guitar solo overlaid on “Church Reprise” is altogether too short, as is the wormhole bass on “Good & Bad". However, even with limited space to work with, probably the most impressive part of Aa is how complete most of its quick hitters feel. Despite clocking in at just over two and a half minutes, “Kung Fu” makes the most of its Pusha T and Future features, the melody’s watery distortion fitting snugly over one of the best hooks Baauer’s ever created. Similarly, “Way For Me” tears through two tempos and an extended beatless midsection, its shuffling hi-hat reminiscent of the producer’s excellent “One Touch” and its morose house conclusion an excellent segue into the unassuming beginning of the killer “Temple". More impressively, Aa is shockingly versatile. Rodrigues has never really been defined by any particularly strict adherence to rote, bro-ey trap, but until now he hasn’t really put his flexibility on display. As it turns out, he’s a master of claustrophobic deluges of washed-out sound. “Body” lurches forward, propelled by a wave of bouncy bass and bleary vocals, while follow-up “Pinku” pins a steadily thrumming house beat to rippling synths and pads. He’s got a great ear for sound and is skilled at corralling disparate, off-kilter elements into a more easily digestible form and Aa is chock-full of vaguely unconventional music and vocal chops neatly repackaged -- take “Sow” and its heavily syncopated bass manipulation and look at how effective the final product is. Whatever his varied abilities, though, Baauer’s always been best with more traditional hip-hop production, and this LP is no exception. “Temple", one of the best songs on the album, bumps forth with a marvelously ragged snare and a simplistic, efficient plucked lead. The M.I.A. and G-Dragon performances aren’t the best they’ve ever put out, but the song still carries them along -- its instrumental is powerful enough that it works anyway. “Day Ones” is even better, horns and humongous kicks making one of the most killer hip-hop tracks of the year so far. The rational conclusion Aa prompts is that Baauer’s success isn’t a fluke. He’s an immensely talented young producer, one who’s a brilliant gateway between more traditional electronic music and absolutely bangin’ trap. Of course, he’ll continue to be looked down upon by LuckyMe’s detractors, people for whom any sort of connection between electronic music and molly-glazed pop should be burned or spat upon. For people who are willing to give that bridge a chance, though, he’s a great choice to push as the big man of the style. Aa, as unfortunately quick as it is, shows a phenomenal young producer at the top of his game, and it’s a joy to experience.